Leave in Heat Spray/ Hydrating Hair Mask/ Shampoo and Conditioner at at £1!! Spotted at Preston Deepdale. Also in home bargains and the pound sections in Asda. Damn, I wish I'd seen those today! 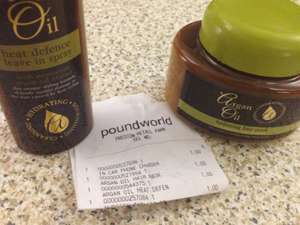 I find the mask to smell awful, have opened a few tubs in store to check but even for £1 i couldn't put it on my hair. I much prefer the Asian brand Dabur Vatika, not much more cost wise if anyone wants to try it, I find it in local Asian shops or large Asda and tesco. I've seen these about 7-8 months ago in poundworld. I've been using the hair mask lately, and so far I am loving it. not impressed with the conditioner. I got these from Lidl a few weeks ago. Wouldn't be the same for everyone of course but they made my hair really fluffy to the point I couldn't do anything with it so stopped using them. Just finished washing my hair with this stuff. Made my hair really soft. And it smells great too. Heated. Fab, thanks. Heat added . i have really dry course thick hair and found this to be the best value for money for it. Leaves my hair shiny. Fantastic shampoo.. Not tried the rest but think the shampoo is definitely one of the best I've personally ever used! Best thing i've found to fix my dry over bleached hair that had broken off, apply a little at the ends of wet hair and dry, if my hair is still a little dry then i'll add a little more on after its dried. Couldn't expect more from this product! and it smells good too! Heat added! I find the mask to smell awful, have opened a few tubs in store to check … I find the mask to smell awful, have opened a few tubs in store to check but even for £1 i couldn't put it on my hair. I much prefer the Asian brand Dabur Vatika, not much more cost wise if anyone wants to try it, I find it in local Asian shops or large Asda and tesco. You do realise that these products have a 'life' once they're opened? Not very nice for the people who subsequently buy them - or don't, and they have to be thrown away. I can't be the only person who would promptly return anything I bought which had previously been opened. not the greatest argon oil products out there but good if you're on a budget this Christmas! You do realise that these products have a 'life' once they're opened? … You do realise that these products have a 'life' once they're opened? Not very nice for the people who subsequently buy them - or don't, and they have to be thrown away. I can't be the only person who would promptly return anything I bought which had previously been opened. You do realise not everything is as fresh as they claim and has been sitting in warehouses for years before making the shop floor don't you, and it won't go off within the time they give due to the huge amount of chemicals and preservatives. If I open something intending to buy it, but I have to check whether they it's just one pot that smells like burnt plastic then I will, like I said even for £1 I wouldn't buy it. Although in b&m I think they were £2.99 last time I was in. And these masks, you wouldn't know they've been opened as surprise surprise they don't need a foil on to keep them fresh, because they aren't. This is cheap crap from China. The shampoo/conditioner has paraffin in it, so you'll get the impression of shine at first, but your hair will soon turn greasy. It's made by Xpel Marketing, who make nicely packaged products but with super cheap ingredients for stores like B&M, Poundland, Home Bargains etc. Probably the best comment on this thread. Poundshop and such shops get items specifically made for their shops to fool the customers into thinking they're getting a bargain.